Tapping on what the client reported: “Even though I’m panicked and scared . . . “. This did not lower the intensity at all because her fear is about what could happen. Future Pacing: The client said that she “freezes in scary situations” so I had her imagine going to school and going through her classes….then hearing frightening noises that triggered the fight/flight/freeze response. I had her imagine taking action instead of “freezing” such as hiding in a closet or going out a window to her car in the parking lot where she would feel safe. She said she felt less anxious afterward and felt like she “had a plan” however; I don’t feel like that was the way to go because I’m thinking she may do something unsafe in a scary situation when it might be better to freeze than take action. I wonder if I should have tried: “What if everything works out fine and all my worrying isn’t going to change anything” yet that didn’t seem like it would be the way to go either. I’m not sure why other than my intuition. A triggered emotional body doesn’t know the difference between past, present and future. The client is presenting with a fear that is being experienced and felt in the present time. It doesn’t matter that the trigger is her thought about a possibility of something happening or a memory of something that did already happen. Here are my suggestions when tapping for fear about a potential future event. Continuous tapping: When you see that the client is distressed or is about to talk about something that will bring distress, suggest that they begin tapping. Make sure the tapping does not distract or disturb their sharing. For example, simply tapping on the karate chop while talking and tapping is adequate. No set up or SUDS needed. Dissociate if necessary: If you believe that there will be too much distress in describing the fear, suggest that the client use some form of dissociation. For example, invite the client to put the fear in the distance, behind a screen, in a box, etc. and start by tapping on that. Choose a target and tap globally: You can start tapping globally or specifically. Global is best if the stress level is high. You may get more specific later. For example, you might start with: this fear, this stress in the body, this panic, school, school danger. Choose a specific target and tap: You can choose a specific target, if it is not too overwhelming. For example, you can choose a physical symptom (tense stomach) or a word or phrase (“recent school shooting”). If you choose to focus on the physical sensations, the client can be specific by focusing carefully on the body and this also causes a level of mental dissociation from the traumatizing story. Just find a target to start with and tap. Once the SUDS are reduced, you will decide where to go next. Ask the client to report any memories that pop up: Remember, current emotional triggers are rooted in past unintegrated traumas. If a memory pops up from childhood, the client will be unlikely to tell you about it unless you ask. They will assume it is irrelevant. It is not irrelevant. It is possibly the root of this current triggering or it will lead you there eventually. But isn’t it normal to be afraid of future tragedies? Yes, it is. We are not taking away a person’s functional flight, flight, freeze response. Gary Craig, EFT founder, used to say, “EFT won’t make you stupid!) We are trying to eliminate unresolved past triggers so the current fight/fight/freeze system is in optimal working order. If the client is so hypersensitive to triggers because of unresolved past traumas, he or she will likely to be less safe in a crisis. What we are trying to do with tapping is to reduce the impact of past unresolved traumas on the current situation. For example, if someone has been through 3 school shootings, we will tap on each one. If someone has been through 3 life events that felt similarly traumatic, we will tap on each one of those past events. After we have done that, the current situation can be dealt with more effectively because it is free of the triggers that pull us into the past. Keep it simple. Have the client feel while tapping. Tune in and tap. Words and questions from the practitioner can be useful if the client is not feeling or is not tuned in, but they can often get in the way. The practitioner should be asking pointed questions and not directing the client in any way, unless necessary to keep them from being too overwhelmed to do the work. It is best to process the upset so the client can generate new thinking. Jumping too soon to your positive reframes of the situation will probably not resolve their fears and could well be a distraction. Use one of these techniques on the imagined future happening. If the work is not finished, you can return to global statements and positive statements that the client constructs to wrap up the session. It is probably not helpful to make suggestions about what to do in the future. A possible choice statement /sneaking away round might look something like this, BUT it needs to be using the client’s words: “Even though I still fear this, my choice is to be free from old and irrational fears so that I can respond instinctively, intuitively and brilliantly in all situations in my life. (tap three rounds – one on the negatives, one on the positive choice statement, then alternate ending with the positive statement). Tapping on the statement, “Even though I am panicked and scared. . . ” was likely ineffective with this client mentioned above in the fact pattern, because the client was not tuned in to a specific target, but rather was overwhelmed and tuning into all of life’s fears – past, present and future. Global /general tapping can be useful, but for lasting shifts, it is usually necessary to break that down into digestible pieces. The practitioner worried that having the client imagine how to respond in the future might cause harm since the plan might not be ideal for every possible future situation. I believe discussing that while tapping served to desensitize some of the fears. While it may not cause a lasting shift, I trust that if the practitioner was acting from a calm and present space, her intuition was solid and that doing this was positive. 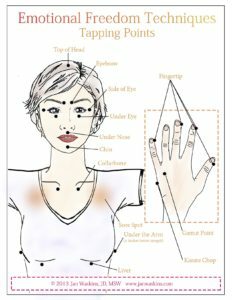 The practitioner mentions that her intuition helped her rule out having the client tap on “What if everything is fine and worrying won’t change. . . ” Usually, if the practitioner is constructing the statements, it will be less powerful than client constructed statements and can even interrupt the client’s process. Asking questions is almost always a good way to stay client- centered. A final note to the practitioners- Tap on your distress and worry, before during and after a session. Stay grounded and present in a session. You are unlikely to cause harm unless you take responsibility that isn’t yours or lead the session with your opinions. A client has defense systems in place and will likely use them. 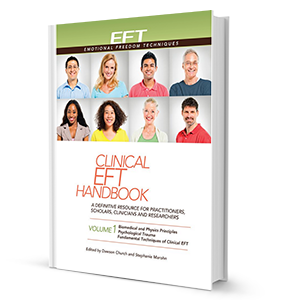 Remember, EFT is client-centered. 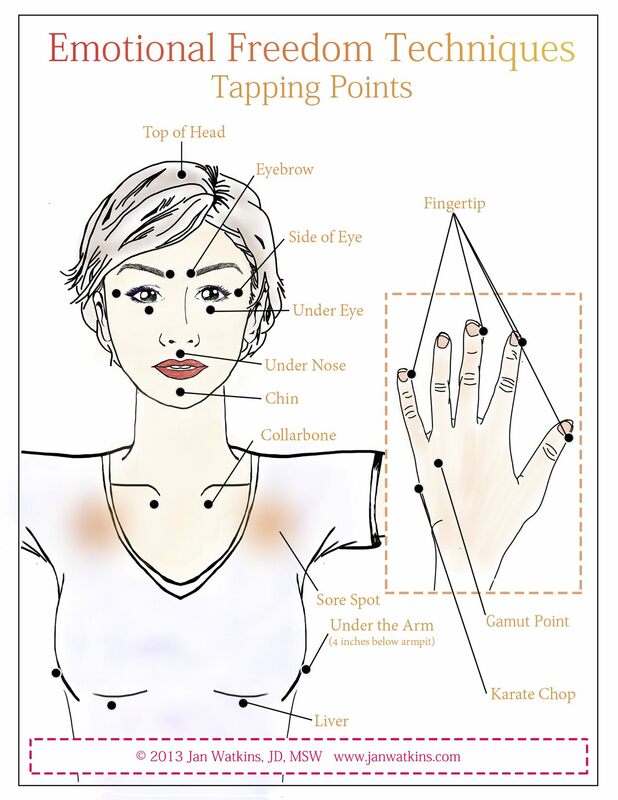 The EFT practitioner is not the expert. Be curious, ask questions, repeat back exact words and keep tapping.